This launch notice didn’t seem to include an email address ( or I missed it) so I emailed my receipt to the email address I had for you. Augh! Thank you for the notice… I’m fixing it. Cheers! If you’re calling these four “debut cards,” does that mean there’s actually a full deck in work? That would be just about too good to be true. 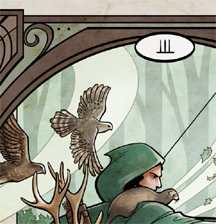 When I reviewed Greenwode on GoodReads, I illustrated the review with images from The Greenwood Tarot. An actual Wode Tarot would be AMAZING. MYTHAGO WOOD is also one of my old-time favourites. As to a Wode Tarot, I’d really like to at least put out a Major Arcana. The Wode readers are a small but mighty group, and with some outreach and through a Patreon or the like, I’m hoping to fund it. Still in the works, but go ahead and sign up for the newletter through the website or here on the blog; that’s the best way to get news directly in your inbox on these sorts of things. Thanks so much for taking this journey with me. I hope it continues to inspire and entertain you as much as it does me. Cheers! What an interesting synchronicity that you have a connection to the Greenwood Tarot. I do have the new one, the Wildwood, as well.